Orion spent the next few hours in agitated excitement. He made sure that he was well groomed and smelled nicer than normal. When it was nearly time to meet Lady Suzu, he went out to the fire pit where Phoenix was kneeling, tending the fire. Phoenix observed Orion’s movements with both curiosity and amusement. Orion shook his head and picked up a stray twig, tossing it into the fire. “I’ve just got a lot on my mind…” Orion looked to the moon and sighed longingly, “I’ll have to tell you later; I’ve got to go.” As Orion walked away from the fire, Phoenix rolled his eyes and stabbed at the glowing logs. 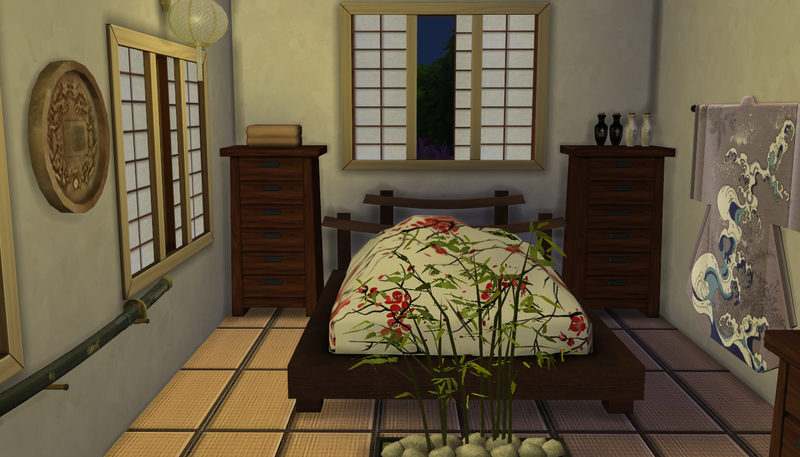 Orion carefully made his way up the steps to Lady Suzu’s room, mentally trying to build up his confidence. He knocked on her door, stepped back, and waited. After what seemed like an eternity, the door opened and there stood Lady Suzu, dressed in a nightdress. She motioned for him to come in and shut the door behind her, slowly turning around and approaching him. “Orion,” she said softly, “I want to thank you for agreeing to this. I’m very happy about our decision.” Orion swallowed and nodded his agreement. Sometime in the early morning, Orion left Lady Suzu’s chambers and headed back to the attendants’ quarters. Phoenix was sound asleep and Orion was thankful that he did not wake. He flopped down on his bed and stared at the dark ceiling. He wouldn’t be able to sleep for a while; his mind was racing. How had he been so lucky to be chosen to be the father of Lady Suzu’s heir? Would the child look more like Lady Suzu or more like him? What if she wasn’t pregnant after all that? Would Lady Suzu have them try again or would she move on to someone else? He didn’t get far before he saw an orange glow coming from the women’s chambers. Fire licked at the paper windows from inside and Orion felt his face pale. He ran back to where Phoenix slept and shouted through the cracked window. He sprinted towards the kitchen and grabbed a water bucket that was left outside for just such an occasion and then back towards the women’s chambers. Phoenix had just arrived, whipping his bedspread at the flames. Adding the water helped and they soon had the fire extinguished. The room was filled with smoke. Orion opened the nearby paper window to let in some air. They heard hurried footsteps above and Tatiana soon came down to see what had happened. She coughed from the smoke and Phoenix rushed over to lead her outside. Orion could hear her voice through the open door. She sounded tearful. 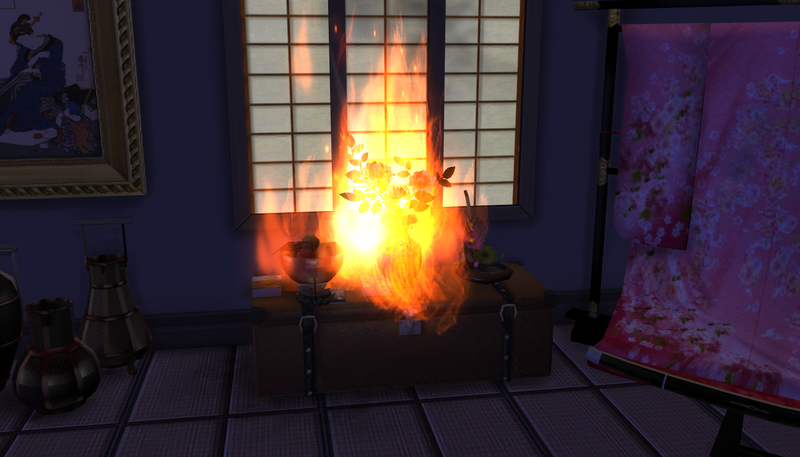 Orion checked the burned remains of what appeared to be a pot of flowers, a bonsai arrangement, some smoldering fruit, and the incense burner. That was the cause. Sighing, he went to gather supplies to clean up the mess. This was actually Phoenix’s job but he was busy comforting Tatiana, who was sobbing into his shoulder. Of course. Wow, I wonder if they’ll interpret the fire to have a symbolic meaning in relation to the unborn heir. Orion is so awesome. He’ll be missed when he has to leave! Haha, that was a nice… ok, no woohoo jokes.